The first of the three main changes in this update is that blocks can now break into pieces. Besides the fact that it looks more spectacular when a building collapses now, it is also a very important part of the gameplay. 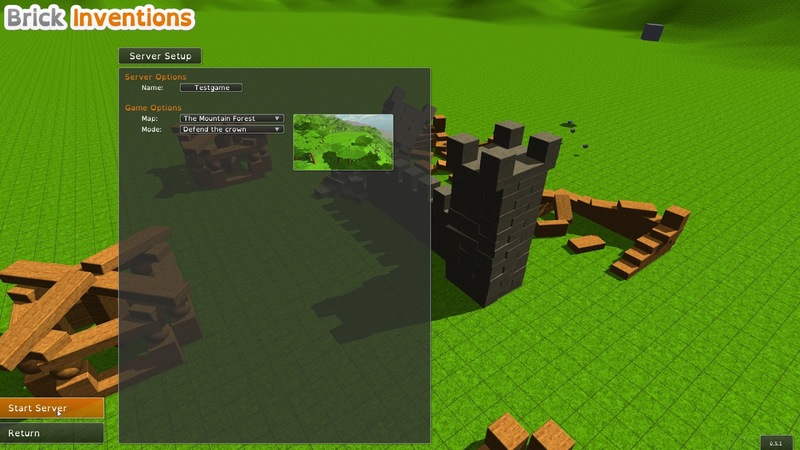 Before I added this feature, blocks started to fill up all the space in multiplayer games as time advanced since you could create more and more blocks, which also had a negative impact on the performance. This mechanic removed blocks from the game to keep things balanced. The second new feature/game mechanic is that bombs do not explode after 5 seconds anymore. Instead, they detonate if they collide with something with a higher velocity (There is still a timer set to 30s but it is more likely that the bomb hits something before the timer runs out). This allows you to shoot bombs over the defences of you enemy or hit them more precisely. In order to get the game ready for release, I rewrote much of the code in the server setup. Now you can configure your server by choosing a name and selecting the map and mode of the game. This feature has to be in the game before I create more maps. Furthermore, I redesigned the player-lobby, which shows all connected players on the server. Like in many other games, there are now multiple player-slots. You can switch between slots, which is important if there are more players in each team. (Note: It is not completely finished yet and there will probably be changes in the following versions). Besides the things mentioned above, I also created a loading screen, improved the balancing and spent much time on fixing bugs. Some of them were in the game for months and I wanted to finally get rid of them (They could be really annoying sometimes ;)). From now on, I will have more time to work on the game again and there is much to come. I already started to work on a trailer for the game and I will continue to work on that. Besides that, I also want to release a gameplay-video of the multiplayer mode. After that, I plan to create the second map and implement one or two special blocks, which will add more variety to multiplayer games.